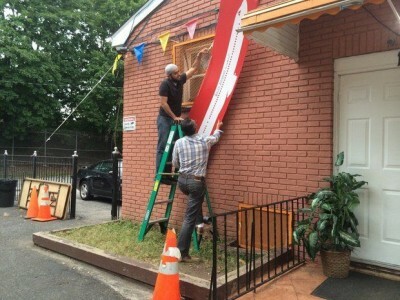 STATEN ISLAND, N.Y. — The Muslim American Society of Staten Island came under scrutiny Tuesday when members of the community noticed a sign containing a picture of a Saudi Arabian airplane on the side of its Dongan Hills building, and became alarmed that the banner was making some sort of anti-American reference — an accusation the society immediately denied. According to Mohammad Badawy, a teacher for the after-school program at the community center, the sign serves as one of the many decorations that he and other workers at the center put up during their annual mock Hajj pilgrimage, which they host for the children in the society’s after-school program. Get used to it, Muslims: people are suspicious of Islam and airplanes.